Multiplexed biological samples (2 or 3) can be metabolically labelled with heavy isotope (13C and 15N) versions of Arginine (R) and Lysine (K) during cell culture. Once the labels are incorporated into proteins, the samples can be mixed and processed further to reduce sample complexity (i.e. SDS-PAGE) prior to trypsin digestion and subsequent high resolution mass spectrometry with accurate mass that uses an LTQ Orbitrap Velos Pro ms system. The data files are then combined prior to analysis for both identification (MS/MS based) and quantitation (MS based) using a range of sophisticated software applications that include: Mascot Distiller, Proteome Discoverer and MaxQuant. 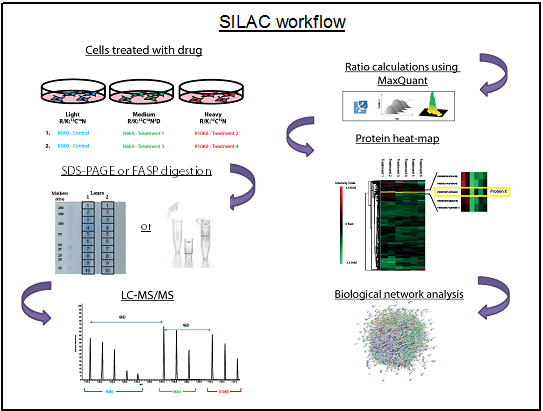 Samples can be accepted at any stage after SILAC labelling and we can perform SDS-PAGE analysis, FASP (Filter-Aided Sample Preparation) or in-solution digests, clean-up, LC/MS-MS analysis and data processing.